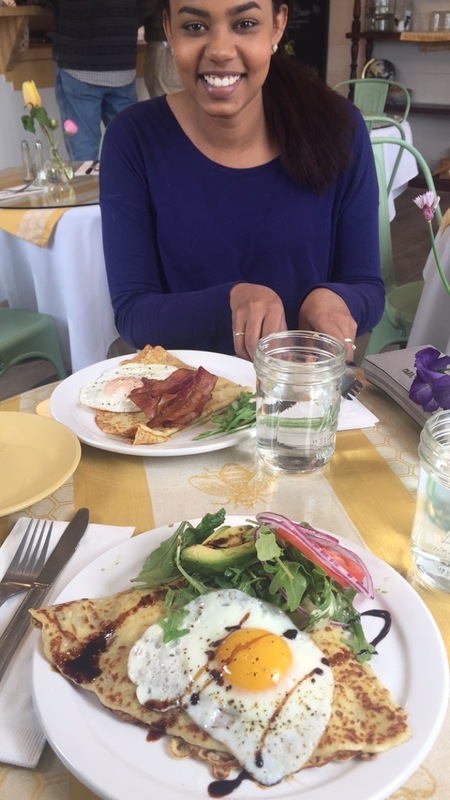 Where to eat in Homer, Alaska? While Homer has a handful of other coffee shops in town, KBay Caffé places high value on not only the quality of their drinks, but also ensures a quality experience for each customer who walks in the door. KBay is locally owned and operated, with their own roasted beans distributed throughout the state of Alaska. While it's a bit more pricey than Captain's Coffee Roasting Co. (on the other side of pioneer), owner Michael McGuire has dedicated the business to supporting farmers practicing organic methods. Plus, every month new, local art rotates through. It's a great spot to relax in-town, and offers a variety of vegan and gluten-free food options. I probably swing by here 2 - 3 times a week, for breakfast, lunch, or just a quick snack! My favorite is their ham & cheese savories...which I rarely stray from. They also have a good selection of gluten-free and vegan options. Everything is baked fresh that morning, and you really wouldn't be getting the full Homer experience if you didn't go to Two Sisters Bakery; delicious soups, focaccia sandwiches, famous lemon bars, and even local beer on draft...it's right by Bishop's Beach, and is the perfect spot to grab snacks for a reasonable price. They also do amazing dinners in the summertime-- but their dinners are definitely more on the expensive side. Who would think that Homer would have such an impressive crepéry? Last summer, my best friend and I always had a "crepé date" here every Wednesday, because we both had the day off. Looking forward to those crepé dates got me through some chaotic weeks this summer! The atmosphere is calm and friendly, and their food is unlike any other restaurant in town. They recently got their beer and wine license, so enjoy a blood-orange mimosa with your savory crepé! For years, Little Mermaid has been my family's favorite restaurant. Last summer was my first summer waitressing there, and look forward to another season! Owners Kathy and Evan Vogl serve the *best* food in town. Yes, I may be biased-- but I thought this long before getting a job there! I'm getting hungry just thinking about their hand-tossed, brick oven pizza specials...some local favorites are their AK Beef Sliders (just $2.50 each!) and hand-cut fries. Since working there, I've tried every dish on the lunch menu-- and it would be hard to choose a favorite. Perhaps grilled, local rockfish on the GORG salad...or the Ahi Poke. They also do dinners! The restaurant has only 5 tables though, so be sure to make a reservation ahead of time. Lunch is walk-in however, so it's best to get your name on the waiting list, and plan to walk around the shops a bit before you're seated. Brick-oven pizza, gourmet sub specials, unforgettable salads, oysters on the half shell...Fat Olives offers something special for everyone in the family! They also have a nice wine and dessert selection. The walls are decorated with paintings from one of Homer's finest artists, Marjorie Scholl. Coincidentally, she lives on the same street as Molly's Family Home. Small town! Looking for great food, but without the expensive fine-dining experience? Alibi is the way to go! Their fish tacos are the best in town (don't tell my boss I said that). The menu has a good variety of Mexican snacks and entrees. Great place to go with a couple of friends and split a big plate of nachos, or steak quesadillas! If you're hoping to catch a big sports game, this is also the place to be. Alibi is hopping on the weekends and attracts a (generally) younger crowd to the dance floor, with either Nelton DJing (the owner), or Michael Hurd from Fractal Theory. Keep an eye out for Karaoke nights here, too. A quirky, yet fine-dining experience just two blocks away; this is where we go for special occasions (birthdays, anniversaries, etc), and there's good reason for it! The building is hard to miss on Pioneer St., decorated with large, ornate tea cups on the front! Cups always offers high quality service, and meals. I'd recommend making a reservation, because it's no secret they're one of the best restaurants in town! Fortunately (or unfortunately) our home is conveniently close to the main three bars in town: Alice's Champagne Palace, Alibi, and Kharachters. My parents have been taking me to Alice's since I can remember-- it's the family, local bar and grill. From local musicians, famous musicians (some that are local Homerites), community events, benefits, Wearable Arts modeling show as a kid, to Trivia nights (every Thursday), Open Mic nights (Tuesdays) and whiskey tastings once I turned 21. It's fun for everyone- kiddos normally have to leave by 10pm. Once in a while Zac Brown (...yes, from the Zac Brown Band) jumps in for one song, with whoever is on stage. Within the last year or two, he bought property here in Homer, and is known to frequent Alice's and Alibi, playing pool and singing karaoke alongside everyone at the bar. In the summertime, during the week after Salmonfest, different bands from the festival play at Alice's every night. The incredible music scene from Salmonfest just keeps going, it's a kick! Alice's also has *by far* the best selection of beer on tap. Also, no night could be complete without ordering their Dirty Fries. Kharachters...is well, full of characters. Important note-- unlike Alibi and Alice's, smoking is allowed inside, and minors are not. It's a funky, small joint with the best pool table in town. If there's not live music happening, the juke box is there for anyone to select songs. You go to Kharachters for the scene and atmosphere, not necessarily for their beer selection, as opposed to Alice's. My friends and I always joke that on a Saturday night you start at Alice's, walk over to the Alibi around midnight, and end up at Kharachters. Why? Alices usually closes around midnight on the weekends, Alibi around 2ish, and Kharachters...well, I've seen them still open at 5am, so it's hard to say. Kharachters (like the Salty Dawg) is a slice of life in Homer. Have you really been to Homer if you haven't tacked a signed dollar bill at the Dawg? Be sure to pick up their iconic hoodie-- I've been in the most random of places down in the states and recognized someone with this hoodie from my hometown. Once you know the design and see it everywhere in Homer, it's hard to forget. As you can tell, almost everything is a block away from our home. If you don't feel like making the trek back, there are plenty of cabs running around the clock; the ride home is short and inexpensive.